Press Enter and voila, the folder is opened in Windows Explorer. Similarly for files. I know that Alfred Powerpack can navigate by keyboard-only, but it is not as intuitive and fast (it doesn't have "search-complete", and it's cumbersome for mounted folders e.g. typing out \Volumes\H\folder\photos). Finder offers the Go to Folder function (found in the Go menu, or by pressing ⇧⌘G), which allows you to type in a path, and has tab-completion (i.e. typing /us TAB r TAB doc TAB gets /Users/rob/Documents/). It's not perfect, the main downfall is that it doesn't present multiple options, it just chooses the last alphabetical match (i.e. if you type do, in a folder with Documents and Downloads, it will auto-complete as Downloads), but it is a decent built-in functionality. 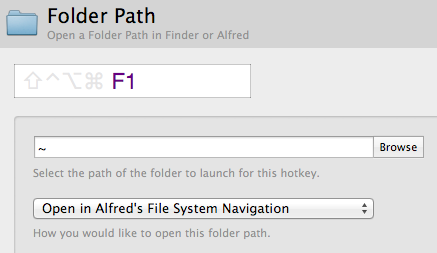 If you have the Alfred Powerpack, you can also assign shortcuts for opening the file browser in specific folders. Just to add a terminal option, you can open the terminal (I use iTerm2) and navigate folders with auto-completion. I have the following command in my ~/.inputrc file so that auto-complete is case insensitive. You can then, depending on how it is configured, tab complete folders and files and double tab to list available options when there is more than one match. As you like the arrow key approach with Windows, you might like arrow keys with OS X. Much shorter approaches are possible but if you like arrow keys, then generally: Command-3 is your friend. Not the answer you're looking for? Browse other questions tagged keyboard folders search navigation . Does iOS 6 turn-by-turn navigation work with satellite images? How to remap finder folder navigation shortcuts? Change Finder folder view for only one folder?